While the majority of the world is looking over the happenings of 2013 and reminiscing, we at The Blue Hutch have packed so much into the first three days of the new year that we need to review. Those readers who need the closure of Christmas posts may need to schedule an extra session of therapy this week, but I can’t help but think you should be used to it by now; rarely do I get photos of Christmas up before mid-January. 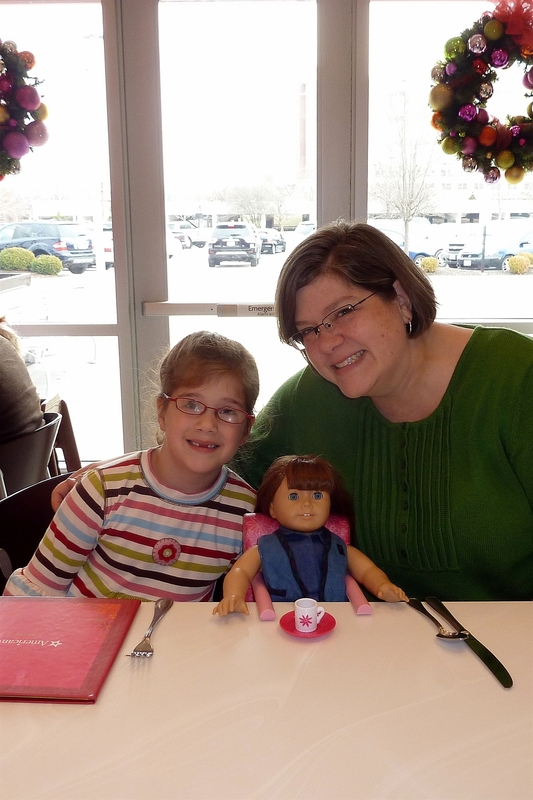 The American Girl doll that KB was given at Christmas came with a certificate for visiting the store, choosing an outfit, having the baby’s hair done and eating at the Bistro. Waiting six days was all KB could manage and it was decided that January 1 would be the day to redeem said certificate. And so I began the new year with an incredibly bad decision and pray it is not an omen of things to follow. 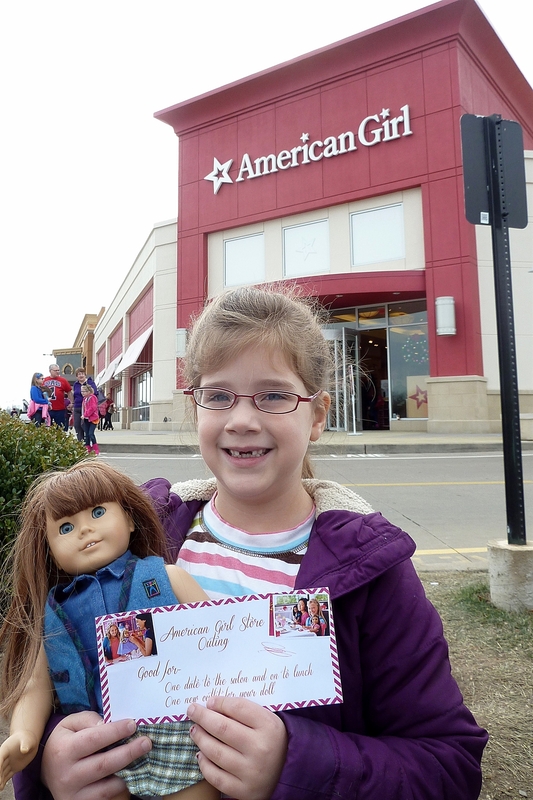 I immediately knew my mistake when I couldn’t find a parking place and then the thoughts trickled into my head that New Years is one of the largest shopping days of the year AND American Girl was introducing their “Doll of the Year”, Isabelle, throughout the day. Yikes. I don’t know if you have been to an American Girl store but it was like Disney World for KB, complete with lines out the door and live characters to meet and talk to (ballerinas from St. Louis Ballet performed while we were there and then walked around chatting with girls about Isabelle, who is also a dancer). We walked through the store and picked a new outfit, made an appointment to have the baby’s hair done, and went to see if we would be able to have lunch. We were seated right away and enjoyed watching the ballerinas while we munched. KB’s doll is a “hand-me-down” doll. We bought it from a lady at church a couple years ago and it has been in our closet just waiting for a daughter to get old enough to take care of her. This year was KB’s “can I have one” year and we had lots of conversations about caring for such a nice doll, etc. The one thing that has bothered KB is that the doll doesn’t have a name and, while I was pretty sure it wasn’t a character doll, I am not familiar enough with the franchise to make that statement without some input. I knew it bothered her and I felt a since of urgency to figure it all out before she was faced with talking to little friends with no filters. The girl at the hair boutique was quick to tell us that KB’s new friend was going to need a name and KB was equally quick to settle on Stacy. There was a calm I saw settle on my little girl’s face with that dilemma behind her, but it was short lived because the hair-dresser continued to talk about the doll and showed KB all the ways she knew that Stacy is very old (poor Stacy). All KB heard was that her doll is not new and she was visibly deflated once again. Holly must have more social awareness than I was ready to credit her with, because she picked up on KB’s reaction and knelt down to look into KB’s eyes. She proceeded to tell KB that all the Isabelles in the store and all the other dolls in the store were made in China but KB’s doll was made in Germany. She told KB that Stacy is very special and restated that fact several more times before settling in to comb and trim her hair. She asked KB to pinky promise to take extra care of Stacy since she is such a special friend and KB was quick to comply. I wanted to hug that hair-dresser, Holly. My favorite parts of the day were watching KB’s eyes sparkle and listening to the things she would say. We had barely been in our seats a minute at lunch and she said wistfully, “I wish Little was here. She would love this.” Heart=Warm. Sigh. And then, “My very favorite part was doing it all with you, Mom.” Nice one. Me too. Oh, sweet KB. . . it is YOU that’s very special. I’m going to stop there for now. I need a tissue and January 2 was a big day but it was such a different kind of big. Sniff. Excuse me. . . So fun!! 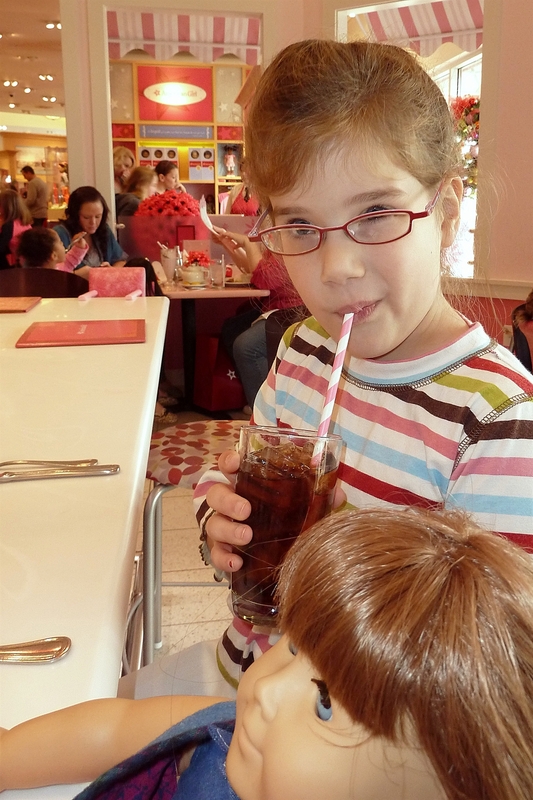 We went on Monday of this past week because Julia finally had enough money saved to get her doll’s ears pierced. That place is wild, hey? Sounds like it turned out to be a pretty good decision :). What sweet memories! Love that sweet girl so much. Precious. We have happy memories from there too!